Woodhenge looking north. Concrete pillars now mark the positions of the wooden post holes. This cairn marks the grave of the child. Site plan including the external bank and internal ditch. 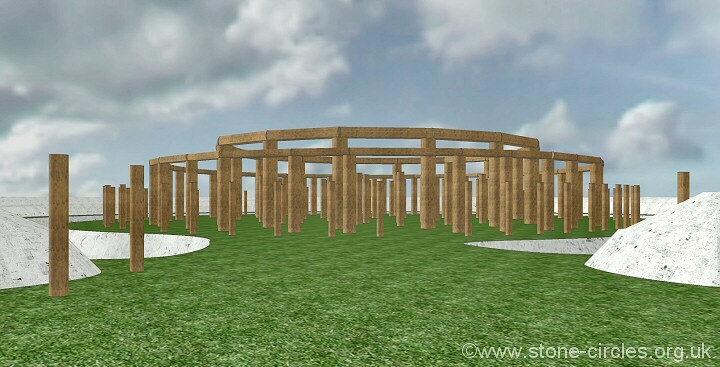 Spherical panorama of the Woodhenge reconstruction (uses Flash). Click and drag your mouse in any direction to view the full scene. This important site close to both Durrington Walls and Stonehenge was first discovered and photographed in 1925 from the air as a series of cropmarks by RAF pilot Squadron Leader Gilbert Install. It was then excavated by Maud and Howard Cunnington between 1926-28 who discovered that what was originally thought to be a ploughed out round barrow was in fact a late Neolithic / early Bronze Age henge monument with a substantial internal wooden structure. The henge itself has a total diameter of about 85 metres and while the outer bank has been ploughed almost flat and the inner ditch has become infilled over the years excavation revealed them both to be about 10 metres wide with the ditch cut almost 2.5 metres into the chalk and with a single entrance causeway to the north-north east. What the Cunningtons discovered within the henge was a series of six concentric oval rings of pits also cut deep into the underlying chalk which they labeled from A to E working inwards from the outer ring. These pits were the post holes for a series of upright oak timbers with the outer oval 'ring A' having a diameter of 43 metres by 40 metres and holding 60 small posts. 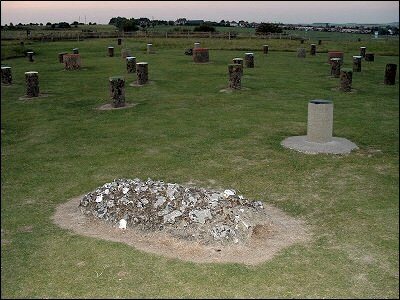 The next two rings had the deepest and widest pits and presumably these held the largest timbers, ring B consisted of 32 large posts while ring C held the largest 16 posts, Maud Cunnington calculated these as being up to 7.5 metres tall. The post holes in rings D, E and F where much smaller and each ring held 18, 18 and 12 posts respectively, all the pits and presumably the timbers, being roughly the same size. The post holes of Woodhenge are now marked by colour coded concrete blocks giving some indication of their size but whether these posts formed the supports of a building or were freestanding, perhaps being carved and painted, is not known and is still disputed by archaeologists. In the reconstruction above I've shown one interpretation of the site with a continuous ring of timber lintels linking the posts of rings B and C. Interestingly, the presumed entrance to the timber circle is slightly further to the north than the entrance to the henge and it could be that the earthworks were a later addition to the site. Also assumed to be slightly later than the timbers were a pair of standing stones that were placed between posts in rings B and C towards the south of the structure - both of these stones are now missing. Whether the wooden posts were still standing, had rotted or been removed when the stones were placed here is not known but the fact that they both stood between a pair of post holes suggests the location of the posts was known to whoever erected the stones. Towards the centre of the site a pit was found that contained the buried remains of a young child - this spot is now marked by a low flint cairn while bones from an adult male where recovered from the ditch towards the entrance. Radiocarbon dating of deer antler picks used to excavate the ditch suggest a date of around 1800BC for the construction of the earthwork while finds of Grooved Ware pottery in pits beneath the bank show that the site was an important place well before the earthwork and timber circles were built.